Thick & Rich High Performance Black Microfiber Material. For use with DA Polishers and Rotary Buffers. Professional grade pads are machine washable. Buff and Shine 4 Inch Microfiber Pad 6-Pack Special. Buff and Shine Microfiber Pads are manufactured with precision in the USA using only the finest foam and microfiber material. Buff and Shine Microfiber Pads have beveled edges for fast and easy pad centering. 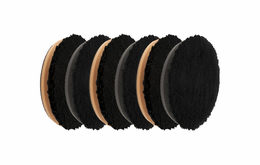 Unique, black and plush microfiber pad material is safe for both cutting and finishing applications. Buff & Shine Microfiber Pads are built for maximum performance and long lasting durability. 4" Microfiber Pad 6-Pack.